While playing with my daughter this morning she pulled out the key-chain pictured here. I noticed that the "Boulder" sticker was sitting on top of another. I peeled it back and found "California" underneath. Growing up in Boulder, spending four years in Silicon Valley, then moving back to Boulder to help build and grow our software/technology sector, caused me to view the picture through several lenses. California is passe and products/companies/people are re-branding themselves as Boulder which is trendy. 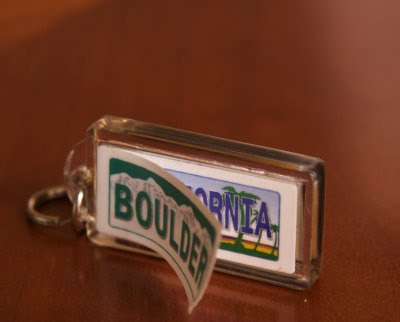 The key-chain manufacturer decided to put California stickers on the keychains as they came off the line, then localize the keychains on-demand and in smaller batches when needed, in order to save cost. Some of Boulder's entrepreneurship is really California underneath. Some of California's entrepreneurship is really Boulder underneath. The Californication of Boulder is real. The migration of Californian's to Boulder continues. A few friends of mine have written some interesting pieces on Boulder along these lines. may others that I don't have time to track down given my kids are unattended in the front yard doing a lemonade stand. While I'm here, I'll plug what's turned into a phenomenal entrepreneurship and technology incubator; TechStars.